After having such a successful season last year, we knew that we had to create something unique for our customers to bid on out our NFL partners home games. Our top designs got together to brainstorm what sort of custom frame could that build that would really stand out at our auctions and could make a memorabilia collectors collection really pop? That’s when the brainstorming led to the idea of adding a lighting system to our memorabilia in shadowboxes. 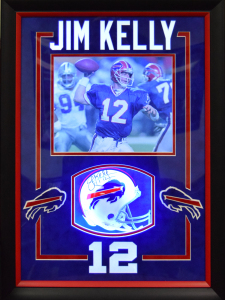 And not just a lighting system but an LED lighting system that won’t make your memorabilia fade in the years to come. 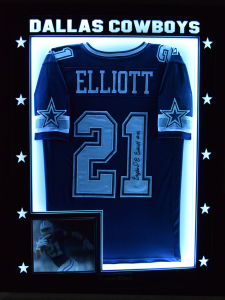 The lights are battery powered and remote controlled with different settings to add more effect when our customers really want to show off their memorabilia to their friends and family. What else is exciting is that this custom design is not just for our memorabilia sold at our partners home games, but it can also be designed for our customer’s memorabilia they already own. The ideas for adding a LED light system into a custom frame are limitless. We have done an LED lighting system for autographed photos, mini helmets, and jerseys. We think that after our customers with the custom framed memorabilia they purchased at a game or brought into our shop, will go home more than happy and ready to show off their new frame to everyone. We at CSD Framing try to make the framing process for our customers as simple as possible. So, if you have memorabilia of your own that you would like to great framed visit https://framing.csdframing.com/ to get started! If you would like to see a video of the lighting system, click here. 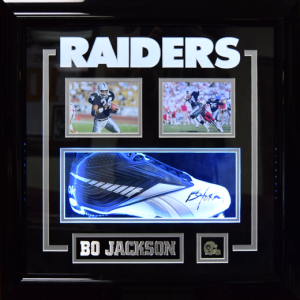 This entry was posted in Company News, entertainment, Events, Framing, Hall of Famers, History, Home Decor, Home Game Auctions, Memorabilia, Sports, Sports Items and tagged buffalo bills, Custom, custom frame, dallas cowboys, Football, frame, LED, LED shadowbox, memorbailia, NFL, oakland raiders, sports memorabilia.